Our project aims to detect the injury based on a cell-free device with three connected enzymes which fixed on a biofilm scaffold. 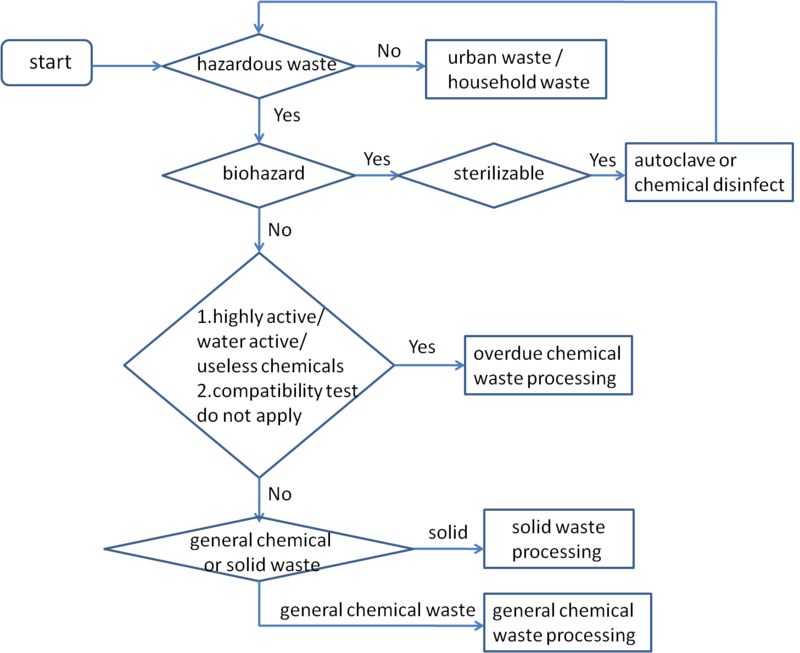 We use blood specimens with biochemical analysis to calibrate our device and help us with our machine learning modeling to set a diagnosis criterion. Our biofilm scaffold consists of curli which is the protein found on the surface of E.Coli. Curli may facilitate bacteria’s invasion into host cells and activate corresponding cytokines and inflammatory mediators in plasma. But the system we wish to produce will be ultimately cell-free and no living organisms will be included. Besides, curli will be immobilized and covered by Nafion on the electrode, so contact with curli will not happen. Therefore, biofilm scaffold is relatively safe. Click here to see the offical collaboration protocol. 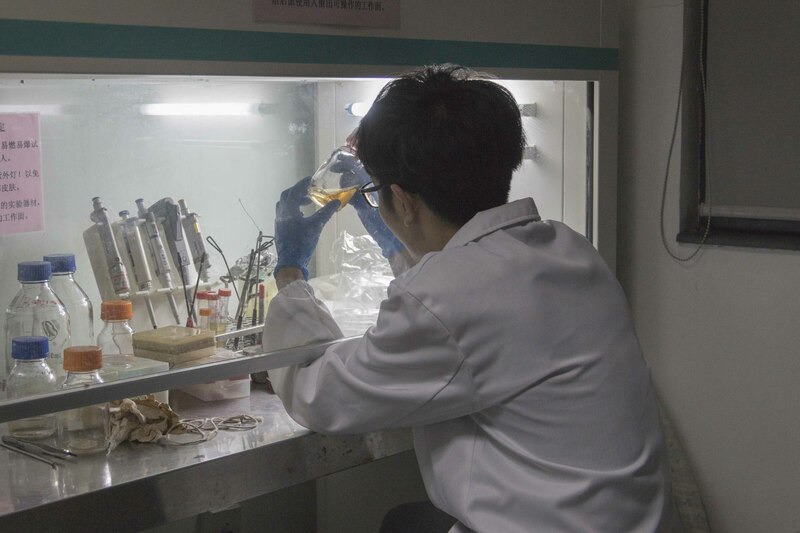 Click here to see the approval from National Demonstration Center for Experimental Biology Education(Zhejiang University). Our project meets ethical requirements. Blood samples we got from hospital are all remaining samples after satisfying patients’ pathological diagnosis need. We keep secret of patients’ privacy information. We conduct experiments with clinical material following our country's laws and our university's rules. The main issue for work with blood samples is the potential for infection. Clinical samples may be contaminated with pathogens. The high risk, well known viral agents such as Human Immunodeficiency Virus (HIV), Hepatitis B virus (HBV) and Hepatitis C Virus (HCV) are not the only agents that may be present in blood. Other viruses such as HTLV1 and B19 as well as various bacterial agents may also be present. Regarding the likely incidence of a pathogen in blood samples, several factors should be considered. These include known medical history of a patient or donor, whether the samples are from individuals showing clinical symptoms of infectious disease, the incidence of the various pathogens that are endemic in the local population or donor group and the type of sample. Fortunately, SIR RUN RUN SHAW HOSPITAL offered us the physiological indices of blood samples and other relevant information. So, the samples we used are from formal approach and relatively less dangerous. To minimize the risks，we have made Standard Operating Procedure (SOP) which is strictly followed in our iGEM lab. As insurance, Blood samples from all patients should be considered infective. The following precautions followed in our lab are also recommended for all health-care workers in clinical laboratories. 1. All the experiments where blood is involved must be conducted in a separate room within the laboratory. 2. All specimens of blood should be put in a well- constructed container with a secure lid to prevent leaking. Care should be taken when dealing with each specimen to avoid contaminating the outside of the container and of the laboratory form accompanying the specimen. 3. Lab surface including correlated equipment is decontaminated with chemical disinfectant prior and after disposal. 4. Every piece of material that has been in direct contact with blood should be disposed of correctly via the clinical waste route when work activities are completed. 5. All persons processing blood specimens should wear gloves. Gloves should be changed, and hands washed after completion of specimen processing. 6. Use of sharp objects (e.g. 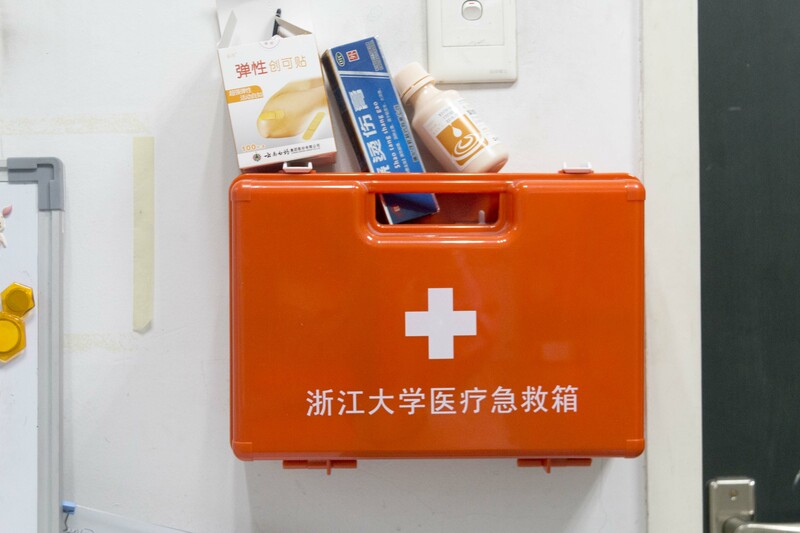 needles, syringes, scissors) should be limited for fear of injuries and cross infection. 7. All persons should wash their hands after completing blood specimens’ processing. Working with living modified organisms is always a risk. All standard precautions must be taken. Before starting to work in the lab, every member of our team was asked to attend laboratory safety lesson and take an biosafety examination. Everyone wears protective lab coats, enclosed leather shoes, gloves and safety glasses before laboratory activities. 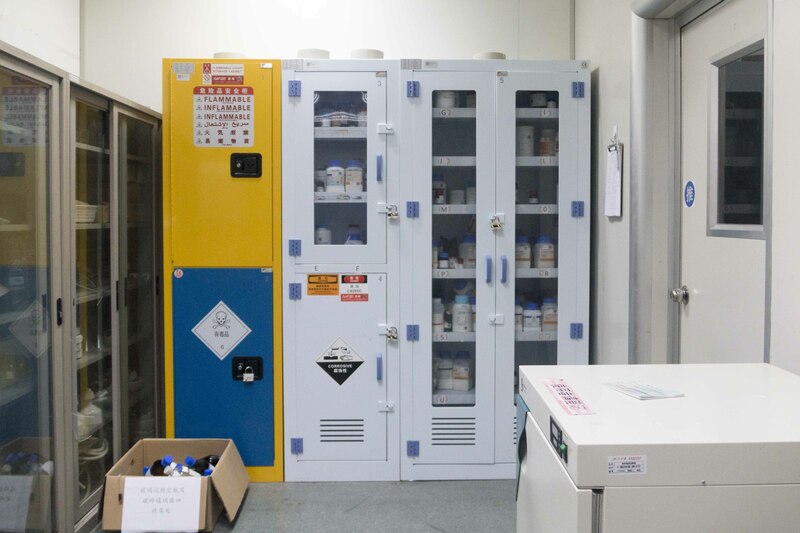 The chemical and biological reagents are stored in the proper place and suitable temperature. Hazardous or corrosive chemicals are stored separately. Waste should be classified and disposed of separately. 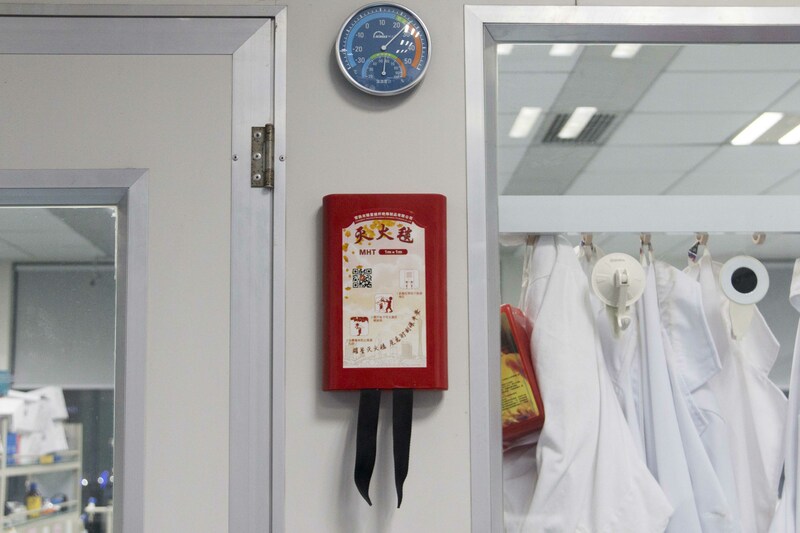 Our iGEM lab is equipped with safety apparatus such as fire extinguishers, emergency showers, eyewash stations, and first aid kits in case of dire situations.